I thought I'd never type this. The long, painfully ugly reign of the oak bathroom light is over. Long live the new light! This is one of those old house things where you start with a small project and it turns into a slow game of dominoes. As part of a project to replace a wiring mess in my hallway in order to install a new light (future post), the electrician discovered a stray wire. We spent some time trying to figure out what it could operate. Finally the electrician jiggled the wire and I listened along various walls to see where it made noise. He unhooked the wire and nothing in the bathroom turned off. We decided to take the bathroom light off the wall to see what was going on. The wire was a stray that lead to nothing (probably an old set of sconces). Then we made another discovery. In order to install this lovely piece of crap (and it's matching medicine cabinet), they had furred out the wall 3 or so inches. Well, this kind of explains the odd clearance for the toilet when I first moved into the house. You had to sit sideways on the toilet (I finally had the toilet turned 90 degrees). What are some people thinking? 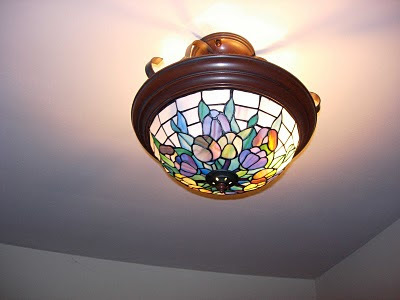 I shudder to think that the original plaster was pulled out to install this light......no, it couldn't be. No one would do that, right? This changes everything. I was going to replace the sink and replace the existing medicine cabinet with a vintage one currently sitting in my basement. I was going to run the current big box tile (which I neither love or hate) through the rest of the bathroom. Now I am thinking reclaim the 3+", if possible. And then while I already have one wall gutted......do I spent the time and money to do the bathroom the way I really would want it?? This would mean a vintage toilet and true vintage style tile (perhaps pink and black). The electrician put in a temporary light for me to use. It already is a 200% improvement, I think. This hideous light is going into the trash. It will not be salvaged anywhere. I am considering it my gift to the world to permanently put an end to it. I searched high and low for back band to replace the trim that was missing or rotted around my front window and door. The search spanned three years, give or take. Tears were shed. Swearing occurred. What baffled me was that back band on my house, is the very same profile that is on 95% of the houses in the Twin Cities. This is not some funky back band. It's pretty generic. Long story short, I finally located the exact back band profile I needed last Spring at Siweks Lumber in NE Minneapolis. At that time I had them cut me a sample of the trim to bring home with me. That sample sat until a few weeks ago when I called a local contractor to get on their schedule and have someone come out and pull out the old trim and replace it with new. The deal was that they would replace the trim. My end of the deal was to obtain said trim, sand it and paint it. So, off I went to buy trim. On the drive to NE, I suddenly started to worry that I would find that the profile I needed had been discontinued. But, my worry was for naught. I showed the lumberyard guy my sample and he walked me over to his supply of that profile. He asked me what measurements I needed. I told him and he started pulling out lengths of trim. All of a sudden, I noticed these faint stripes on the trim. I looked a little closer and realized that every 5" or so, the trim was finger jointed. I even asked they guy..."are those finger joints?" He looked at me and said "yup." Like I was some sort of newbie for even asking. Well, it's not like I have a whole lot of choices when it comes to this trim. This is it. And compared to the $10/ft quote I received at the start of my search.......the $1.50/ft they were charging me for this trim was a bargain. I paid the man, loaded my trim into my car and headed home. Concerned, I asked my dad (structural engineer) his thoughts. No, he had never seen that done before on trim. It was good in the sense that the trim is extremely straight. No, he did not share my concerns that it would fall apart immediately. Even if it only lasted a 5-10 years, he pointed out, replacing it wouldn't break the bank. So, I coated the finger jointed back band with wood preservative. It then received two coats of primer. If ever there was finger jointed back band set up to succeed, it is this bunch of trim going on the front of my house. The guys at Scheftel are fitting my project in between their larger projects. One guy was out last week and got the old trim off of the front window...and the new side pieces installed. He's going to wrap the upper edge of the top piece of trim in copper, so that was delayed for a bit. Once that's done, I'll need to paint the trim and caulk. There is a bit more to this project (isn't that always the case) and I'll talk more about that in my next post. Finally, in past posts commenters and I wondered why we never saw back band in the local salvage places. The last picture explains that. Pulling back band out of stucco, as it turns out, is not an easy task.